Step into a heart-racing immersive adaptation of F Scott Fitzgerald’s seminal jazz-age novel that puts you in the heart of the action. Slip on your dancing shoes and watch the story unfold around you in this unique theatrical performance. What is The Great Gatsby about? F. Scott Fitzgerald’s much-loved novel is brought to life in extravagant style at Gatsby’s Drug Store. Surround yourself in the decadence and excitement of the roaring 20’s, a time of opulent glamour, sizzling summers and riotous parties. 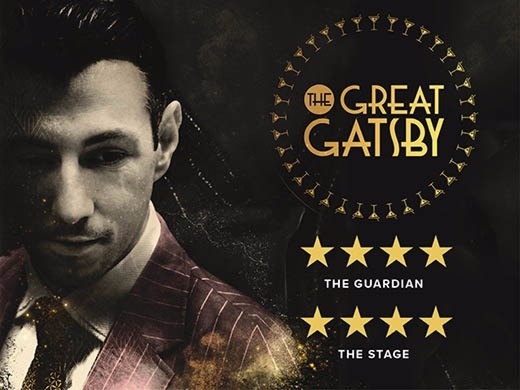 Get up close and personal with the Old Sport himself as you’re thrown into the centre of one of the world’s most infamous stories, experiencing it like never before. You’ll love every moment of this unique theatre experience in London’s West End; this is one party you won’t ever want to end. Anyone aged 16-18 must have a valid form of ID. Please print and bring your confirmation. Anyone under the age of 16 MUST be accompanied by an adult over the age of 18+. Very talented actors. Sadly the venue was very hot and stuffy with no aircon and minimal ventilation so had to leave halfway during the show as I started feeling too sick, which was a shame. The staff were kind to offer help. There aren’t enough seats so you may end up standing for most, if not the whole time (some older audience sat on the floor towards the end) - something to bear in mind for elderly and ladies wearing heels. Some of the soundtracks were not true to the 1920s theme but the actors were convincing. Overall experience was unique, lots of people dressed up in theme which added to the experience. Very good performances and interaction with the audience. The sets could be a bit more carefully designed. I will go again and again. Was amazing!!! Wasn’t sure what to expect when we first arrived but honestly a fantastic experience! Highly recommended to everyone of any age as it’s truly a night to remember!! If you want to immerse yourself in a unique theatrical experience get your self a ticket to this show! A highly talented cast of actors who took the audience on a roller coaster journey as party guests of Mr Gatsby . All characters completely convincing .The audience are cleverly integrated to great effect throughout the performance either as entourage to individual characters or to witness more intimate moments of high drama away from the main performance area. Go and see this incredible production and dress up in your best 1920s party gear ! However this is not for anyone who wants posh toilets or pre ordered interval drinks in the theatre bar . It's about brilliant storytelling and a truly unique theatre experience which we loved !! A must- see if you are curious about a new kind of theatre experience where you become extras in the play! From the first step inside, we were drawn into the 1920s New York world of Gatsby. Others, like us, had dressed up for the era - flapper dresses, boas, suits and hats - impressive! Actors engaged the audience in sharing the story in words, actions, dance and songs by moving from party scene to intimate drawing room to bar to balcony - exciting and fun. Highly rcommended! It’s quite interesting!This is the first time that I enjoy the story via joining the life of all the roles in that story.You speak with them, dance with them and party with them! My sister and I went as her Christmas present (knowing her love of Gatsby). It was my first experience of immersive theatre, and I was warned before we went in that it wouldn't be like anything I had ever experienced. We were blown away by the environment, the ensemble cast (Rosy in particular who greeted us on entry and then always seemed to pop up near us at various times!). The whole show was incredible. We ended up in a few alcoves over the course of the evening, which left me with the frustration of wanting to know what was going on elsewhere. It was dazzling, full of jazz and liquor, and the dancing was such a lot of fun. We are eager to come back and see the show from a different angle (and trying to follow another storyline). I wasn't sure exactly what to expect but I loved every second of it. They really engaged the audience and the actors who played Gatsby and Jordan did a fantastic job! I would definitely recommend going to see this! The most amazing performance I've seen thus far. A great interactive experience and superb performances from the cast! A fabulous immersive theatrical experience! I bought tickets for myself, my mum and sister for my sisters 30th birthday. We went to a Saturday evening performance. The show was fantastic from getting dressed up in 1920's gear, learning the charleston and the copious amounts of gin. The actors were incredible and remained in character the entire time. The performances and mini performances in separate rooms were great and no matter which scenes you saw it was easy to follow along with the story. The atmosphere at the venue is fantastic everyone in our group had a great evening. I found the bar quite reasonable £4 for beer and £6 for G&T. I like that the bar is card only, it means not having to worry about carrying cash. I would definitely see this show again as I know you would have a different experience every time and would recommend to anyone considering going to see this! The type of play and the way it was executed was beyond amazing! I would recommend this to everyone who loves and adores the Great Gatsby! It’s a unique and more interactive play that is just amazing to be part of and watch! Sorry to say that we did not enjoy the experience. We were treated like naughty children for much of the evening with the venue facilities being poor to say the least. Loved everything about this incredible show and still I can't figure out how they did it all!! So brilliant. The dancing was amazing, and wish we could have done more! We went as a group of 4 friends and all had a great time. We dressed up as did almost all of the 'audience' and this definitely added to the atmosphere and feeling of belonging at the event. We loved the interaction with the cast and how it made all the events 'come to life'. Well cast and well acted and full of atmosphere. Dancing was brilliant too. I recommend highly. This performance was unlike anything I had ever seen before. The actors were so true to their roles and so real and the plot was fast paced and enthralling. The performers were so friendly and delightful, I spoke to them after wards and they were so committed it was inspiring. It was a fantastic experience. My friends and I enjoyed the night. The actors are amazing, and they really brought us into the play. The settings and atmosphere are perfect for the show. Love it! If you like immersive theatre with hidden rooms where actors play out secret scenes, then this is for you. But even if you don't seek out the 'extras' it's still great fun. "F Scott Fitzgerald’s novel comes to life in the Guild of Misrule’s fancy-dress interpretation, though you may be too busy playing spin the bottle to hear the whole story"